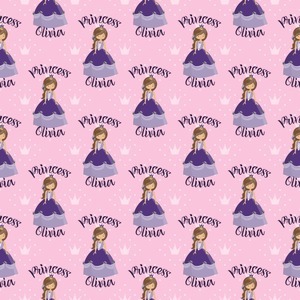 What a fantastic personalized princess design. We have created layered design using our simple crowns and dots design. We then layered it with a graphic of a princess along with the works princess on top and name below the graphic. This graphic, along with the text then form the repeat for the design. This is truly custom personalized design. You can customize almost all aspects of the design. You can customize the top and bottom text, along with the font and color. The princess' hair color, skin color, eye and even her crown and dress color can be customized. We also have a number of other princesses in our system, so you can always change out the princess. The background pattern and color customizable. Love the design and want to keep it simple? Just change the name, the hair, skin and eyes color - and you are done!